Until just recently, it never crossed my mind that pork spareribs could be cooked any way other than barbecued. Really. Who ever heard of such? 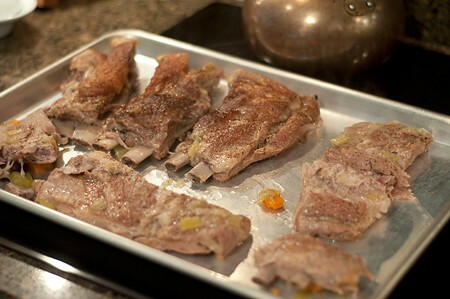 Until…I ran across this recipe by Martha Stewart that used spareribs as the meat in a ragu. Wow. It didn’t take me long to get myself to the grocery store and back with some spareribs so I could see just exactly what this was all about. Let me tell y’all something. This is one delicious sauce! It’s meaty and rich and just absolutely perfect in every way. The original recipe calls for it to be served over polenta but, being the good southern girl that I am, I served ours over grits. 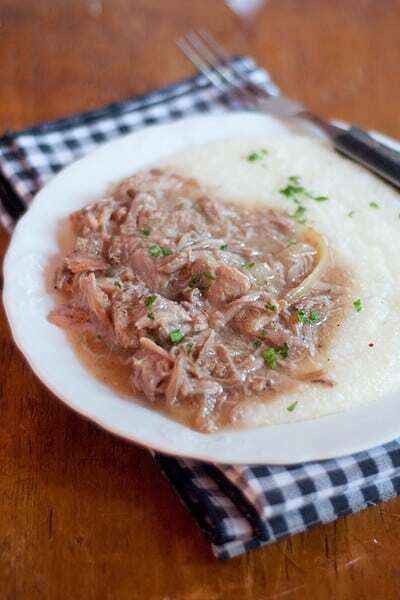 Hot buttered grits with pork rib ragu sauce on top. You just can’t imagine the deliciousness that is this recipe. You gotta give this a try for yourself. Prep the vegetables. Just in case you haven’t worked with leeks very much, you should know that they’re often very dirty. They may not look like it on the outside but there’s usually a good bit of dirt and mud between the layers. Here’s how I clean them. Cut the leek lengthwise then crosswise into half moon shapes. 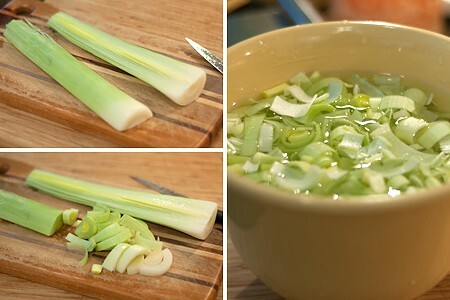 Put the cut leek in a medium bowl filled with cold water. Agitate the leek gently to help loosen any dirt. Let it sit for a few minutes. The dirt will settle to the bottom of the bowl and the leek will float in the water. Skim the floating pieces of leek from the top of the water without disturbing the dirt on the bottom. Lay them on a couple of folded paper towels to drain. Peel the carrots. Coarsely chop the carrots and celery. Season the ribs generously with salt and pepper on both sides. Cut the ribs into 2- or 3-rib pieces. 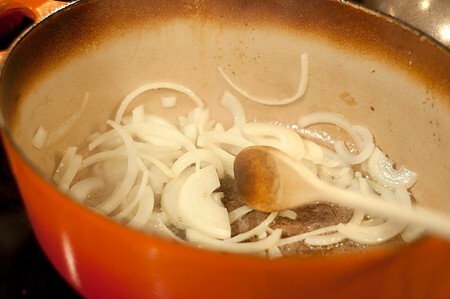 Place a large Dutch oven or other large heavy pot over medium heat and add the oil. Cook the ribs in batches until browned on all sides, about 5-6 minutes per batch. Do not crowd the pan while browning. 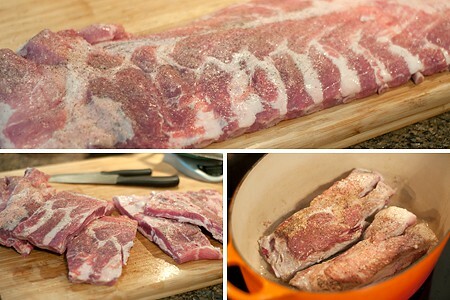 Transfer the browned ribs to a plate. 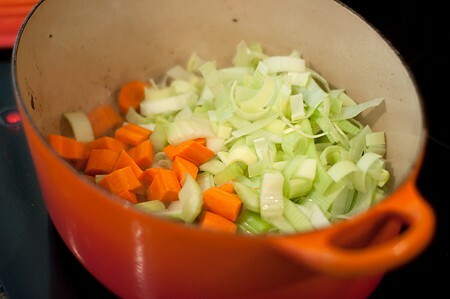 Add the leek, carrots, and celery to the fat remaining in the pot. Cook, stirring frequently, until the vegetables soften slightly – about 5 minutes. Add the wine, bring it to a simmer and cook until reduced by about half. Return the ribs to the pot and cover with water. This is as nearly covered as I could get mine without spilling over the top of the pot. It’s okay if they’re not completely submerged :-) Bring to a boil. Remove from the heat, cover tightly and place in the preheated oven. Cook until the meat is falling off the bones. It will take about 3 1/2 hours. Transfer the ribs to a rimmed baking sheet. Strain out and discard the vegetables. Transfer the cooking liquid into a heatproof bowl. Skim as much fat as possible from the liquid. 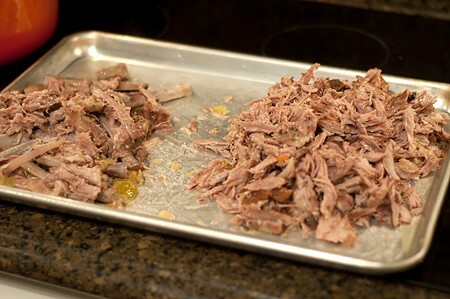 When the ribs are cool enough to handle, shred meat (discard fat and bones). Alternately: You can stop here and refrigerate the strained cooking liquid and meat for several hours or overnight. The fat will rise to the top of the liquid making it easy to remove. You’ll also remove much more fat using this method. Back in the same cooking pot, melt the butter over medium heat. Add the onion and cook until soft, about 8 minutes. Stir in the flour. Gradually whisk in the cooking liquid. Bring to the boil, then reduce the heat to a lively simmer and cook until thickened. Add the pork to the sauce and cook until heated through. When ready to serve, make the grits. Just a word about grits if you don’t mind. Please, please get a good regional brand of grits like Jim Dandy (my favorite) or Dixie Lily. I know there’s a national brand that distributes grits, but they are far from desirable. And make sure they’re white corn grits, not yellow. They’re two totally different things. Really. Bring the water and salt to a boil. With a whisk, slowly stir in the grits. Bring back to the boil then lower the heat to a simmer. Cover and cook for 5 minutes. Add butter and stir until butter is melted. Serve the ragu over a generous portion of buttered grits. Garnish with chopped fresh parsley if desired. Slow braised pork ribs with aromatic vegetables served over hot, buttered grits. Prep the vegetables. Cut the leek lengthwise then crosswise into half moon shapes. Put the cut leek in a medium bowl filled with water. Agitate the leek gently to loosen any dirt. Let it sit for a few minutes then remove the floating pieces of leek from the top of the water and lay them on a paper towel to drain. Peel the carrots. 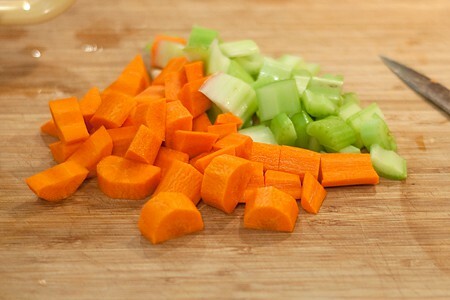 Coarsely chop the carrots and celery. Season the ribs generously with salt and pepper on both sides. Cut the ribs into 2- or 3-rib pieces. Place a large Dutch oven or other large heavy pot over medium heat and add the oil. Cook the ribs in batches until browned on all sides, about 5-6 minutes per batch. Do not crowd the pan while browning. Transfer the browned ribs to a plate. 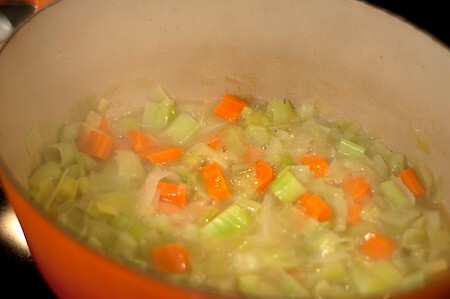 Add the leek, carrots, and celery to the fat remaining in the pot. Cook, stirring frequently, until the vegetables soften slightly - about 5 minutes. Add the wine, bring it to a simmer and cook until reduced by about half. Return the ribs to the pot and cover with water. Bring to a boil. Cover tightly and place in the preheated oven. Cook until the meat is falling off the bones. It will take about 3 1/2 hours. Transfer the ribs to a rimmed baking sheet. Discard the vegetables and strain the cooking liquid into a heatproof bowl. Skim as much fat as possible from the liquid. 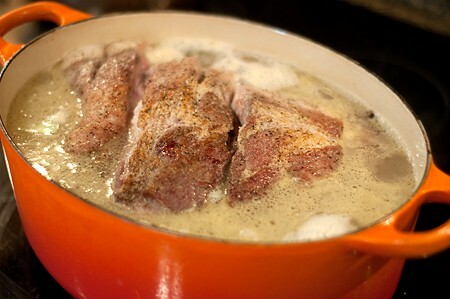 Alternately: stop here and refrigerate the strained cooking liquid and meat for several hours or overnight. 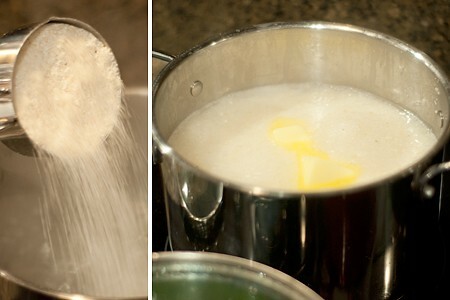 The fat will rise to the top of the liquid and can be easily removed. In a medium saucepan, melt the butter over medium heat. Add the onion and cook until soft, about 8 minutes. Stir in flour. Gradually whisk in the cooking liquid. Bring to the boil, then reduce the heat and simmer until thickened. 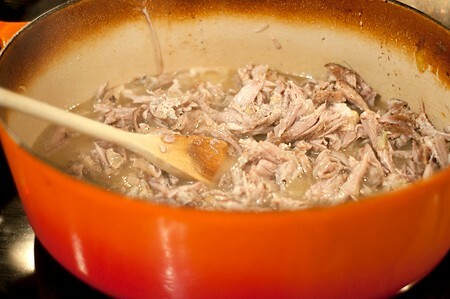 Add the pork to the sauce and cook until heated through. When ready to serve, make the grits: Bring the water and salt to a boil. With a whisk, slowly stir in the grits. Bring back to the boil. Lower the heat to a simmer. Cover and cook for 5 minutes. Add butter and stir until butter is melted.